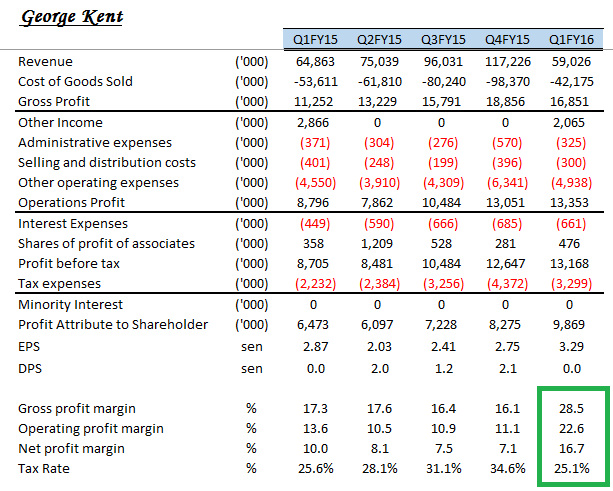 George Kent just released its first quarter result last week. The group recorded lower revenue compared to same quarter preceding year and almost half if compared to previous quarter. But thanks to its much better gross profit margin, the group able to record better bottom line. Operating income and expenses almost similar. In terms of balance sheet, both trade receivables and payables also dropped. Good thing is the group able to reduce its loan amount to almost same as one year before. From the cash flow statement, it can be seen that the group generated a very healthy operating cash flow. Since its manufacturing segment only required very low amount of capex, the group chalked up a very good free cash flow. Here comes with the interesting part, segment reporting. For its manufacturing segment, I would love to see the segment able to maintain above 20% operating profit margin. That would be a very good improvement from 15% (FY2014) and 19% (FY2015). Management pointed out that it was due to lower operating expenses incurred. But I guess for manufacturing industry, normally the management able to reduce the operating expenses to certain extend only and maintain from there. For its engineering segment, management pointed out that the gross profit margin is higher due to higher weightage on revenue from certain projects with relatively higher profit margin and the Group’s Kuala Lipis Hospital Project has just started. However, the contribution of the hospital project is quite low. I believe the higher profit margin of the engineering segment is not sustainable due to the nature of the revenue recognition of contract based projects just like what happened in Q4FY14. It's still highly depends on the Ampang line LRT extension project. Dato Tan pointed out that there was delay in Ampang Line LRT extension project. However, Prasarana CEO stated days later that there was no delay and the phase 1 is on track and will begin operation in Oct 31 2015. So, who should we trust? Besides, Dato Tan also mentioned the group target to add another RM2 or RM3 billion worth of contracts this year on top of RM1 billion orderbook on hands. I think we should ignore this kind of blow water issue. I still remember he said the same thing during last year AGM on top of gonna diversify into oil & gas segment. Well, I think he did not expect the sudden drop in crude oil price at the end of last year which indirectly affected the numbers of construction jobs awarded. The biggest surprise to me about George Kent is ColdEye bought the counter recently as shown in the latest annual report.